“I am no different than the decaying rose as I wail,” cries Zeki Müren—arguably the most prominent singer that classical Turkish music has introduced, as well as the grandest of queer icons in his country—in Üzgünüm Leyla (I’m sorry, Leyla), a heart-wrenching anthem of longing and the namesake of Sinan Tuncay’s solo exhibition at United Photo Industries. In his first New York solo exhibition, Tuncay, a Turkish native currently based in New York, undertakes depictions of the gnarly ways his home of origin idolizes, performs and reenacts masculinity–and therefore queerness–by channeling the Orientalist roots of his country that underwent influential westernization policies upon foundation of a secular republic in the early 1920s. The limit of individualistic tone and blockage of alternative perspectives for the sake of masculine identity prevail in Tuncay’s archival prints, for which he pursues a meticulous process, merging the traditional genre of miniature painting with computed manipulation. Similar to a miniature painter repeating an identical form for every human figure and object, Tuncay documents the same male and female models in a variety of postures and outfits, later digitally collaging their small-scale forms into different narratives. 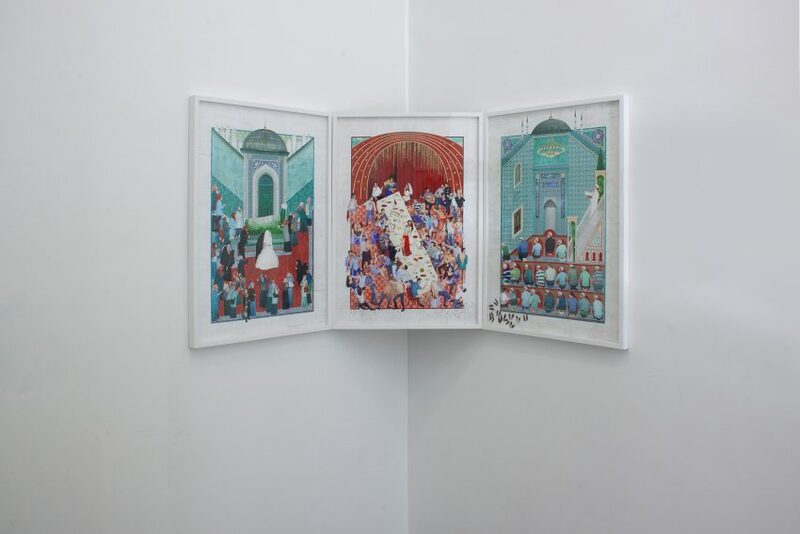 Orchestrated using props that he additionally photographs aside to human forms, Tuncay’s prints chronicle traditional public rituals such as weddings, prayers and bridal baths, each communally practiced within its designated locale. In his seminal novel My Name Is Red, Nobel Prize-winning Turkish author Orhan Pamuk gives voice to a single tree standing in an Ottoman era miniature: “I don’t want to be a tree; I want to be its meaning.” Yearning for depth and autonomy, this tree poses no different than any other tree it is depicted alongside. 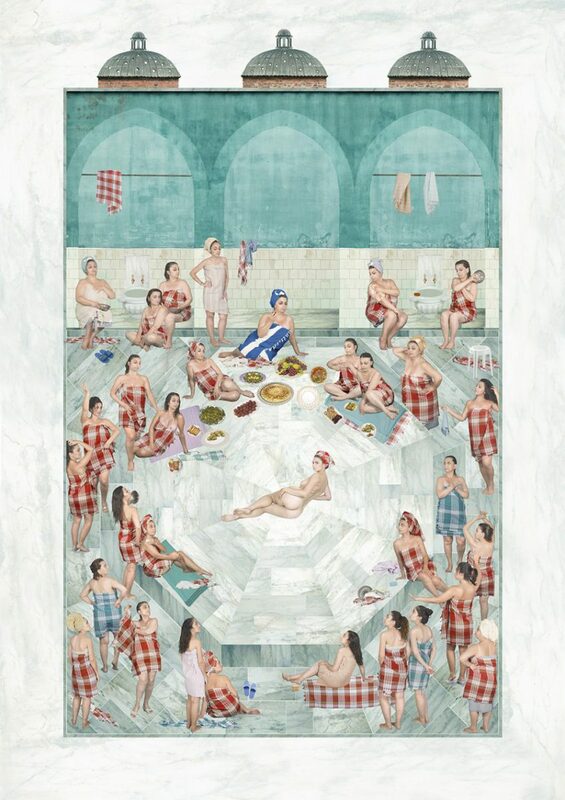 Restricting characteristic features and perspective-wise depth, defined techniques of miniature painting allows Tuncay a visual narrative in which coded stereotypes of Turkish society such as macho young men, celibate girls or promiscuous belly dancers remain anchors of these fixed characterizations. Avoiding variant physical attributes, Tuncay delves into juxtaposition of given stereotypes and their positioning in societal patterns. Unlike preceding miniaturists of the Ottoman era however, Tuncay employs his figures’ distinct performative gestures, complex facial expressions and poignant attires, complicating typically restrained bodily and architectural depth that traditional miniatures perpetuate. 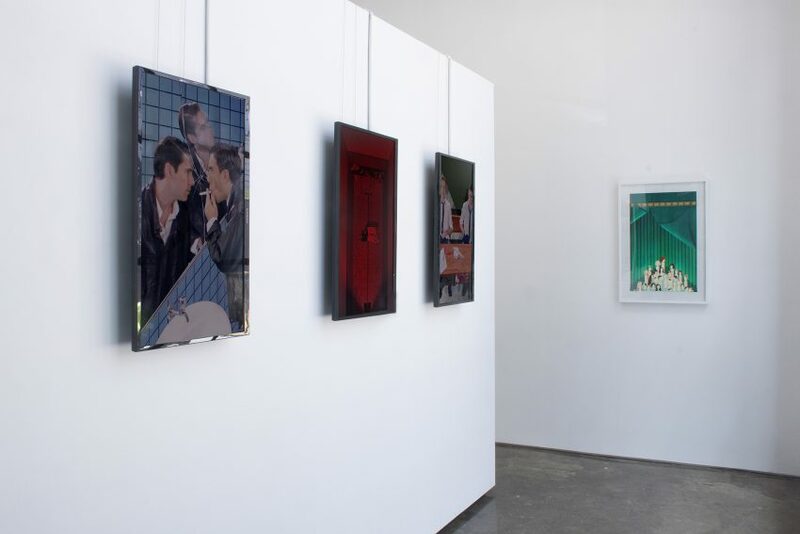 Unveiling communal dogmas and prejudicial norms blanketing singular identities, Tuncay translates affixed behavioral structures into their own satires. Furthering Tuncay’s scrutiny of monotony in characterization is Mommy’s Not Home. 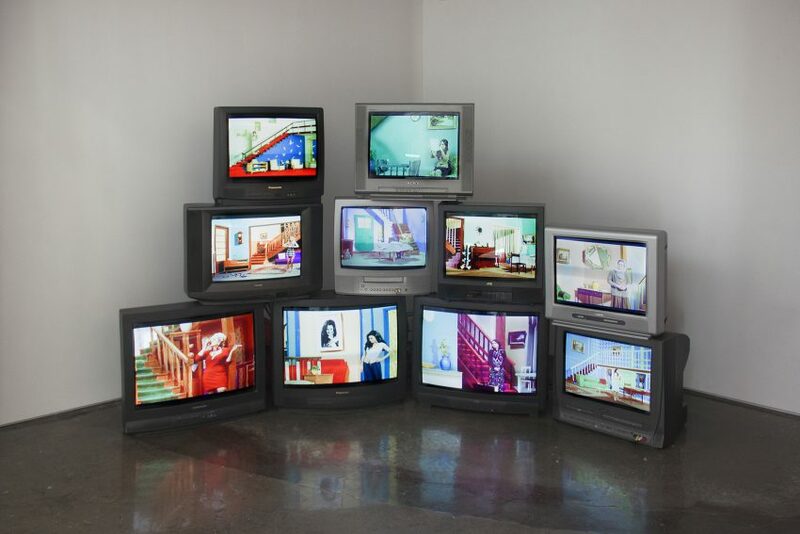 Arranged as a ten channel video installation behind lace curtains, the intriguing work streams clichéd female roles arduously repeating in plots stuck between ethics of conservative ideologies and westernized urban lifestyles in traditional Turkish cinema. Naive virgin from the periphery, rich and restless blond who studied in Europe or selfless poor mother suffering from a terminal disease fill in their designated roles after Tuncay Photoshops them into typical settings he built on miniature scale. The artist, who grew up watching reruns of such films as a child, blends their plasticity with the harshness of dominant social norms. 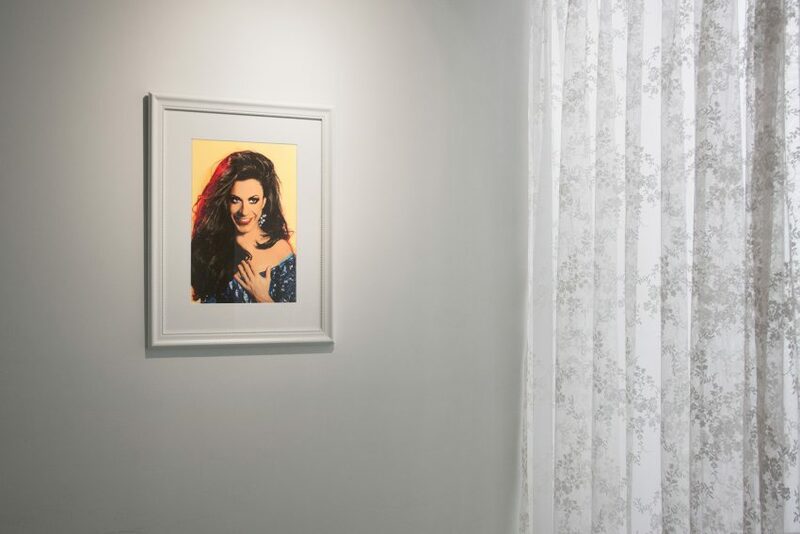 Complementing the installation is Self-portrait as Leyla, Tuncay’s reimagining himself as Leyla, the lead female role as commonly called in such films, and as Türkan Şoray, the legendary Turkish actress who numerously appeared in these roles. Tags: baths, I'm Sorry Leyla, masculinity, My Name Is Red, Orhan Pamuk, Sinan Tuncay, Türkan Şoray, Turkish cinema, United Photo Industries, wedding ceremony, Zeki Müren. Bookmark the permalink.